Jack White has said launching The White Stripes was "the most challenging" thing that has ever happened to him. The US rocker found fame alongside drummer Meg White with the band, which produced six studio albums before officially splitting in 2011, and it remains an important experience for him. He said: "The truth is, it's the most challenging thing that ever happened to me. "There was no bigger challenge than that - to try to win people over with just two people. It will be hard for me to ever think of something to challenge myself as much as that because of its simplicity." 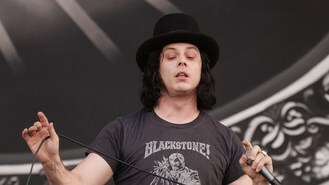 The star - also a member of The Raconteurs and The Dead Weather - has now released his first solo album, Blunderbuss. He is also set to pen the musical score for upcoming movie The Lone Ranger. Kimberley Walsh is teaming up with Alfie Boe to sing the official anthem for Britain's Olympic hopefuls. Gwyneth Paltrow's mother Blythe Danner has revealed she used to wear earplugs to son-in-law Chris Martin's gigs. Cee Lo Green has said he'll stick with US show The Voice "as long as it's fresh". Lady Gaga has reportedly split from Taylor Kinney, her boyfriend of ten months. Chris Martin has revealed that years of playing live has left him with tinnitus. Noel Gallagher has cast Mischa Barton in the music video for his new single. Damon Albarn has revealed he grew up wanting to become a farmer. Beyonce is accustomed to getting awards for writing songs, but now she has earned one for writing a magazine piece. The Wanted are being given a cinematic boost after their forthcoming single was chosen to feature in new movie Ice Age 4: Continental Drift.